The goal of this study was to evaluate the influence of obstructive sleep apnoea on the severity and short-term prognosis of patients admitted for acute coronary syndrome. Obstructive sleep apnoea was defined as an apnoea–hypopnoea index (AHI) >15 h−1. We evaluated the acute coronary syndrome severity (ejection fraction, Killip class, number of diseased vessels, and plasma peak troponin) and short-term prognosis (length of hospitalisation, complications and mortality). We included 213 patients with obstructive sleep apnoea (mean±sd AHI 30±14 h−1, 61±10 years, 80% males) and 218 controls (AHI 6±4 h−1, 57±12 years, 82% males). Patients with obstructive sleep apnoea exhibited a higher prevalence of systemic hypertension (55% versus 37%, p<0.001), higher body mass index (29±4 kg·m−2 versus 26±4 kg·m−2, p<0.001), and lower percentage of smokers (61% versus 71%, p=0.04). After adjusting for smoking, age, body mass index and hypertension, the plasma peak troponin levels were significantly elevated in the obstructive sleep apnoea group (831±908 ng·L−1 versus 987±884 ng·L−1, p=0.03) and higher AHI severity was associated with an increased number of diseased vessels (p=0.04). The mean length of stay in the coronary care unit was higher in the obstructive sleep apnoea group (p=0.03). This study indicates that obstructive sleep apnoea is related to an increase in the peak plasma troponin levels, number of diseased vessels, and length of stay in the coronary care unit. Obstructive sleep apnoea (OSA) is a common disease that affects 3–7% of the general population [1, 2]. Sleep apnoea is caused by the collapse of the upper airway during sleep, which leads to transient asphyxia. OSA is associated with an increased risk of fatal and nonfatal cardiovascular events  and effective continuous positive airway pressure (CPAP) treatment reduces the incidence of hypertension and cardiovascular events . The consequences of OSA are largely mediated by chronic intermittent hypoxia and sleep fragmentation, which may contribute to the pathogenesis of cardiovascular disease in patients with sleep apnoea . Intermittent episodes of hypoxia and arousal cause an increase in sympathetic activity  and sudden changes in systemic blood pressure , which contribute to the development of myocardial hypertrophy, cardiac arrhythmias and death. OSA is associated with abnormalities in cardiac autonomic and electrophysiological factors, including heart rate variability, the duration of the QT interval, baroreflex function, and chemoreceptor sensitivity. Serious and potentially fatal arrhythmias occur during sleep in patients with OSA  and are attenuated by effective treatment with CPAP . Subjects with OSA are at increased risk of sudden death from cardiac causes during sleeping hours . These pathogenic factors in OSA patients may play an aggravating role in the severity of acute myocardial infarction (AMI) and the short-term prognosis of patients. Nevertheless, a cardioprotective role of OSA in the context of AMI, via ischaemic preconditioning, has also been postulated. This latter hypothesis implies the activation of adaptive mechanisms, such as the increased recruitment of proliferative and angiogenic endothelial progenitor cells . Furthermore, patients with OSA reportedly exhibit less severe cardiac injury during an acute nonfatal myocardial infarction compared with patients without OSA . Due to this contradictory evidence, we performed an observational study to evaluate the impact of OSA on the severity and short-term prognosis of patients with acute coronary syndrome (ACS). The objective of the study was to compare the ejection fraction, Killip class, number of diseased vessels, peak troponin, length of hospitalisation, number of complications, and mortality rate of a cohort of ACS patients with and without OSA. 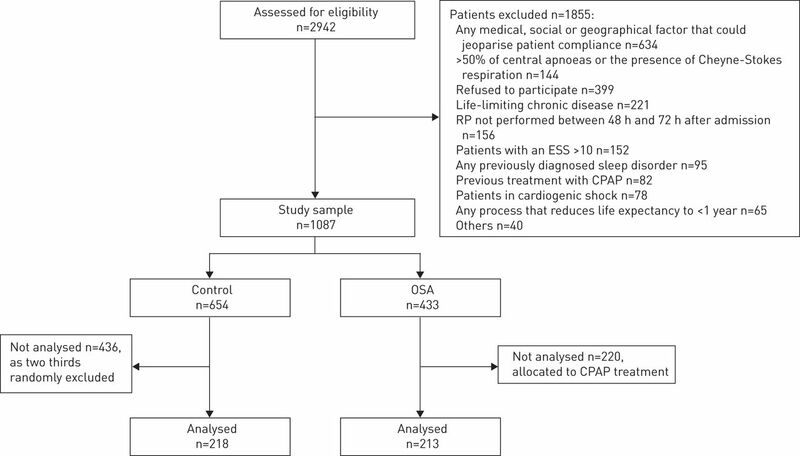 This is an ancillary study of the ISAACC study (a randomised trial of NCT01335087 (Continuous Positive Airway Pressure (CPAP) in Patients With Acute Coronary Syndrome and Obstructive Sleep Apnea (OSA) (ISAACC)), which is a multicentre, open-label, parallel, prospective, randomised, controlled trial . The ISAACC study evaluates the effect of CPAP treatment on the incidence of new cardiovascular events in patients with an episode of ACS and OSA. The ISAACC study includes nonsleepy patients because it is unethical to fail to treat OSA patients with excessive daytime sleepiness. We evaluated patients who were admitted for ACS to coronary care units or cardiology hospitalisation wards at fourteen teaching hospitals in Spain (male and females aged ⩾18 years). Those patients who met the inclusion criteria and did not meet any of the exclusion criteria underwent respiratory polygraphy during the first 48–72 h after admission. Patients with an apnoea–hypopnoea index (AHI) >15 events·h−1 were randomised to conservative or CPAP treatment. Those patients with an AHI⩽15 events·h−1 were considered controls. Because we expected that 70% of the patients who underwent respiratory polygraphy would exhibit an AHI⩽15 events·h−1, we randomly excluded two thirds of these patients to guarantee the same rate of inclusion as in the OSA group. It was performed using a computer-generated random numbers list. For the current study, we compared the short-term prognosis and severity of the ACS for patients included in the conservative arm versus the control group (fig. 1). Study flowchart showing recruitment to study. RP: respiratory polygraphy; ESS: Epworth Sleepiness Scale; CPAP: continuous positive airway pressure; OSA: obstructive sleep apnoea. Acute coronary syndrome was defined as the acute presentation of coronary disease with or without ST elevation infarction, unstable angina, or type 1 MI . The exclusion criteria included the following: previous treatment with CPAP; psychophysical inability to complete questionnaires; the presence of any previously diagnosed sleep disorder; patients with >50% central apnoeas or the presence of Cheyne–Stokes respiration; daytime sleepiness (Epworth Sleepiness Scale (ESS) >10); patients with chronic diseases, e.g. neoplasms, renal insufficiency (GFR <15 mL·min−1·1.73 m−2), severe chronic obstructive pulmonary disorder (a forced expiratory volume in 1 s <50%), chronic depression, and other limiting chronic diseases; a medical history that could interfere with the study objectives; any processes, whether cardiovascular or otherwise, that reduce life expectancy to <1 year; and patients in cardiogenic shock. The ethics committee of each participating centre approved the study (approval number in the coordinator centre: 2010-852), and patients provided written informed consent. The diagnosis was based on the results of overnight cardio-respiratory polygraphy, which is in accordance with the guidelines of the Spanish national consensus on the apnoea–hypopnoea syndrome . All participant centres used the same model of polygraph (Embletta; ResMed, Bella Vista, Australia) for the diagnosis of OSA. Oronasal flow, thoracoabdominal movements, ECG, and pulse oximetry were recorded. Apnoea was defined as an absence of airflow lasting ⩾10 s. Hypopnoea was defined as a reduction in airflow lasting ⩾10 s associated with oxygen desaturation. Oxygen desaturation was defined as a decrease in arterial oxygen saturation >4%. Respiratory polygraphy studies were performed without supplemental oxygen. The AHI was defined as the number of episodes of apnoea and hypopnoea per hour of recording. The degree of self-reported sleepiness/drowsiness was analysed by the Spanish version of the ESS test . Echocardiographic evaluation and Killip classification were routinely performed during patient admission. The Killip classification focuses on physical examination and the development of heart failure to predict risk. The classification considers four classes (I–IV). Class I indicates no evidence of heart failure, and Class IV represents cardiogenic shock. During hospitalisation, we evaluated the severity of the ACS (ejection fraction, the Killip scale, number of affected vessels, number of stents implanted and peak troponin) and the short-term prognosis (length of stay in the coronary unit, length of hospitalisation, complications and mortality). The cardiologists who evaluated the ACS severity were blinded to OSA versus control status. Data for each participant were uploaded to a database. Only the coordinating centre (Hospital Univ. Arnau de Vilanova and Santa Maria, IRBLeida, Lleida, Spain) had full access to the database. The mean±sd or frequencies (%) were computed to evaluate the differences between the control and OSA patients with respect to anthropometric and clinical variables and ACS related risk factors, assessing the significance with Mann–Whitney or Chi-squared tests, respectively. Secondly, the association between OSA and variables related to ACS severity and short-term prognosis were assessed with the Mann–Whitney or Chi-squared tests and linear or logistic regression models, as appropriate. Additionally, the models were adjusted for tobacco (current or former smoker versus nonsmoker), age, body mass index (BMI) and hypertension. To evaluate the difference in the mortality observed in patients with and without OSA, an exact test, based on independent binomial distributions, was used given that only one case was observed. Thirdly, the association of the degree of OSA with variables related to ACS severity and short-term prognosis was also assessed using AHI quartiles (Q) and the Kruskal–Wallis or Chi-squared tests and linear and logistic regression models, adjusting for tobacco (current or former smoker versus nonsmoker), age, BMI and hypertension. For these analyses, p-values from ANOVA or deviance tables were calculated considering the four AHI-based groups as qualitative and ordinal integer variables. Logarithmic transformation of continuous response variables was performed for the models, assessing the log-likelihood of this transformation with a Box-Cox analysis. For ordinal qualitative variables, integer values were used to perform a linear regression model to assess the trend. Finally, for those variables related to ACS severity with a significant difference between control and OSA patients, a Gini criterion was used to determine an optimal threshold. Odds ratios, corresponding 95% confidence intervals, and p-values estimated from logistic regression models were obtained; adjusted p-values were also computed. All analyses were performed using the R statistical package . The threshold for significance was set at 0.05. The sample sizes, of 213 patients with OSA and 218 controls, provided a statistical power of 84% to detect differences in the mean length of stay in the coronary care unit and a statistical power of 87% to detect differences in the distribution of plasma peak troponin levels, when compared by nonparametric tests. The significance level was fixed at 0.05. We included 218 patients with an AHI ⩽15 events·h−1 (control group) and 213 patients with an AHI >15 events·h−1 (OSA group). OSA patients were slightly, but significantly, older than the controls (table 1) (p=0.0002). Hypertension was more prevalent in patients from the OSA group (table 1) (p=0.0004), who also exhibited an increased use of diuretics and calcium antagonists (table 1) p=0.02 and p=0.0009, respectively). Additionally, OSA patients exhibited a higher BMI and were less likely to be current or former smokers than control patients (table 1) (p<0.00001 and p=0.04, respectively). 95% of OSA patients and 91% of controls underwent peripheral coronary intervention, which included 42% and 44% undergoing primary peripheral coronary intervention, respectively. With respect to ACS severity, the percentages of patients with Killip classes II–IV and ⩾3 diseased vessels were higher in the OSA group (table 2) (p=0.03 and p=0.006, respectively). For OSA patients, we observed that the mean ejection fraction was lower, whereas the mean peak troponin was higher (table 2) (p=0.04 and p=0.005, respectively). However, the analysis adjusted for smoking, age, BMI and hypertension revealed that only the peak troponin levels were statistically significant (table 2) (p=0.03). With respect to the ACS short-term prognosis, the mean length of stay in the coronary care unit was higher in the OSA group even after adjustment (table 3) (p=0.01 and p=0.03). Nevertheless, the length of hospitalisation, number of complications and mortality rate during hospitalisation were similar between the groups. To further investigate the strength of the association of ACS severity-related variables with OSA severity, we classified the patients into four groups according to AHI Q1–4. The results confirmed that the peak troponin levels increased with each AHI Q, even after adjustment (table 4 and fig. 2) (p=0.0003 and p=0.002). Additionally, this analysis revealed that the number of diseased vessels was higher for the most severe OSA group (AHI >27.2 events·h−1), even after adjustment (table 4 and fig. 2) (p=0.001 and p=0.04). Moreover, the odds ratios for three or more diseased vessels (with respect to one vessel) were 2.07, 2.08 and 2.36, when comparing individuals above AHI Q1–3 with respect to those below Q2–4, respectively (table S1, p=0.11, p=0.006 and p=0.04). However, when analysing the association between ACS short-term prognosis with OSA severity, there was no statistically significant association (table 5). Association between acute coronary syndrome severity variables and obstructive sleep apnoea. a) Frequency distribution for the number of diseased vessels in apnoea–hypopnoea index (AHI) quartiles (Q). b) Peak troponin mean values for AHI Q1–4, segments represent one standard deviation. The analysis was adjusted by smoking, age, body mass index, and hypertension. The adjusted p-values in table 4 are shown. Finally, we determined an optimal threshold for each ACS severity outcome to discriminate between OSA and control patients with the goal of obtaining a more detailed description of this association. This analysis demonstrated a significant increase in the risk of an OSA patient to have a peak plasma troponin level >724.5 ng·L−1 (table 6) (OR 2.59, p=0.02). This analysis also revealed a significant increase in the risk of an OSA patient to exhibit an ejection fraction lower than 51.5% (table 6) (OR 2.05, p=0.04) and a tendency to present with more than three diseased vessels (table 6) (OR 1.96, p=0.06). The results of this observational study suggest that OSA influences the severity of ACS and its short-term prognosis. OSA is related to an increase in peak plasma troponin level, a decrease in the ejection fraction, and an increase in the number of diseased vessels. After adjusting for smoking, hypertension, and BMI, only the peak plasma troponin levels remained significantly related to OSA. The OSA severity, evaluated by AHI, is related to the number of diseased vessels and the peak plasma troponin levels. Patients with OSA spent more time in the coronary care unit, although the length of hospitalisation was similar between patients with and without OSA. Available data from clinic-based cohorts suggest that OSA is an independent risk factor for myocardial infarction and other coronary events [3, 18–21]. Furthermore, OSA worsens the long-term prognosis of ACS [22, 23]. Several pathogenic factors are proposed as intermediate mechanisms linking OSA with cardiovascular disease . It has been described that systemic inflammation induced by chronic intermittent hypoxia may play a key role in atherogenesis in OSA patients . These intermediate mechanisms can produce cardiac hyper-excitability and increase the sympathetic tone, oxidative stress and hypercoagulability, which could in turn increase the severity of ACS in OSA patients and worsen the prognosis of ACS. Additionally, chronic intermittent hypoxia increases the infarct size in animal models . Also, the deleterious effects of sleep disordered breathing in infarct expansion and impaired healing of myocardial tissue and coronary artery plaque burden have been described [26–28]. The increased number of affected vessels and the increase in the peak plasma troponin levels in the group of patients with OSA could be associated with worse long-term prognosis. In contrast to our results, Lee et al. reported similar severity in acute myocardial infarction in patients with and without OSA. This study also demonstrated that there was no significant association between OSA and impaired microvascular perfusion after primary percutaneous coronary intervention. Interestingly, Shah et al. explained that patients with OSA exhibit less severe cardiac injuries during an acute nonfatal myocardial infarction compared with patients without OSA. The authors suggest a cardioprotective role of OSA during acute myocardial infarction induced by ischaemic preconditioning. Berger et al. demonstrate that patients with AMI, who exhibit mild-to-moderate sleep disordered breathing, can activate adaptive mechanisms and may improve endothelial function and provide cardioprotection in the context of acute myocardial infarction. Additionally, organ autoregulation could be a mechanism implicated in maintaining a constant blood flow during fluctuations in its perfusion pressure in patients with ACS . The strengths of our study include its multicentre design with a large number of patients. All participating centres performed the same methodology and the sleep study was performed with the same model of polygraph. Nevertheless, this study has several potential limitations. First, we excluded patients with the more severe ACS and worse prognosis (cardiogenic shock). Additionally, we excluded patients with daytime sleepiness who exhibited the most severe OSA. Nevertheless, the number of excluded patients for these causes was relatively low. Secondly, subjects in this study were predominantly male, therefore, the results cannot be extrapolated to females. Thirdly, the diagnosis is based on respiratory polygraphy, which could underestimate the severity of OSA. However, due to the critical situation of the patients, full polysomnography monitoring could be a stressful procedure for this high-risk patient group. Finally, the design of this study does not allow us to draw definitive conclusions and further randomised control trials on this topic will be necessary. The results of this study indicate that OSA is correlated with an increase in the peak plasma troponin levels, number of diseased vessels, and length of stay in the coronary unit. These correlations may have both short- and long-term consequences. Large-scale randomised control trials are urgently needed to evaluate interventions in this setting. Support statement: Supported by ResMed Ltd. (Australia), Fondo de Investigación Sanitaria (PI10/02763 and PI10/02745), the Spanish Respiratory Society (SEPAR), the Catalonian Cardiology Society, Esteve-Teijin (Spain), Oxigen Salud (Spain), ALLER and Neumomadrid. Obstructive sleep apnea-hypopnea and related clinical features in a population-based sample of subjects aged 30 to 70 yr. Am J Respir Crit Care Med 2001; 163: 685–689. Increased prevalence of sleep-disordered breathing in adults. Am J Epidemiol 2013; 177: 1006–1014. Long-term cardiovascular outcomes in men with obstructive sleep apnoea-hypopnoea with or without treatment with continuous positive airway pressure: an observational study. Lancet 2005; 365: 1046–1053. Effect of continuous positive airway pressure on the incidence of hypertension and cardiovascular events in nonsleepy patients with obstructive sleep apnea: a randomized controlled trial. JAMA 2012; 307: 2161–2168. Obstructive sleep apnoea and cardiovascular disease. Lancet Respir Med 2013; 1: 61–72.
. Mechanisms of vascular damage in obstructive sleep apnea. Nat Rev Cardiol 2010; 7: 677–685. Sympathetic neural mechanisms in obstructive sleep apnea. J Clin Invest 1995; 96: 1897–1904. Obstructive sleep apnea and the risk of sudden cardiac death: a longitudinal study of 10,701 adults. J Am Coll Cardiol 2013; 62: 610–616.
. Cardiac rhythm disturbances in the obstructive sleep apnea syndrome: effects of nasal continuous positive airway pressure therapy. Chest 2000; 118: 591–595. Day-night pattern of sudden death in obstructive sleep apnea. N Engl J Med 2005; 352: 1206–1214. Endothelial progenitor cells in acute myocardial infarction and sleep-disordered breathing. Am J Respir Crit Care Med 2013; 187: 90–98. Obstructive sleep apnea and acute myocardial infarction severity: ischemic preconditioning?. Sleep breath 2013; 17: 819–826. Rationale and methodology of the impact of continuous positive airway pressure on patients with ACS and nonsleepy OSA: the ISAACC Trial. Clin Cardiol 2013; 36: 495–501.
. Classification of myocardial infarction and unstable angina: a re-assessment. Int J Cardiol 2013; 167: 2387–2390. Spanish National Consensus in Sleep Apnea-Hypopnea Syndrome (SAHS). Arch Bronconeumol 2005; 41: Suppl. 4, 3–11. Validación de la versión española del test de somnolencia Epworth en pacientes con síndrome de apnea de sueno [Validation of the Spanish version of the Epworth Sleepiness Scale in patients with a sleep apnea syndrome]. Arch Bronconeumol 1999; 35: 422–427.
. Increased incidence of coronary artery disease in sleep apnoea: a long-term follow-up. Eur Respir J 2006; 28: 596–602. Obstructive sleep apnea as a risk marker in coronary artery disease. Cardiology 1999; 92: 79–84. Obstructive sleep apnea as a risk factor for coronary events or cardiovascular death. Sleep Breath 2010; 14: 131–136. Sleep-disordered breathing and cardiovascular disease: cross-sectional results of the Sleep Heart Health Study. Am J Respir Crit Care Med 2001; 163: 19–25. Respiratory disturbance index: an independent predictor of mortality in coronary artery disease. Am J Respir Crit Care Med 2000; 162: 81–86. Sleep-disordered breathing and coronary artery disease: long-term prognosis. Am J Respir Crit Care Med 2001; 164: 1910–1913.
. Predictors of elevated nuclear factor-κB-dependent genes in obstructive sleep apnea syndrome. Am J Respir Crit Care Med 2006; 174: 824–830. Major role for hypoxia inducible factor-1 and the endothelin system in promoting myocardial infarction and hypertension in an animal model of obstructive sleep apnea. J Am Coll Cardiol 2009; 53: 1309–1317. Impact of sleep-disordered breathing on myocardial salvage and infarct size in patients with acute myocardial infarction. Eur H J 2014; 35: 192–199. Independent association between obstructive sleep apnea and subclinical coronary artery disease. Chest 2008; 133: 927–933. Severity of obstructive sleep apnoea predicts coronary artery plaque burden: a coronary computed tomographic angiography study. Eur Respir J 2013; 42: 1263–1270. Obstructive sleep apnea in patients admitted for acute myocardial infarction: prevalence, predictors, and effect on microvascular perfusion. Chest 2009; 135: 1488–1495. Impaired cerebral autoregulation in obstructive sleep apnea. J Appl Physiol 2008; 105: 1852–1857.